In Pakistan, Female Police Officers Are Rare. This One Quelled A Militant Attack "I am, with the grace of almighty Allah, a successful role model for women," Suhai Aziz Talpur says. The senior police official led an operation against militants who attacked the Chinese consulate. 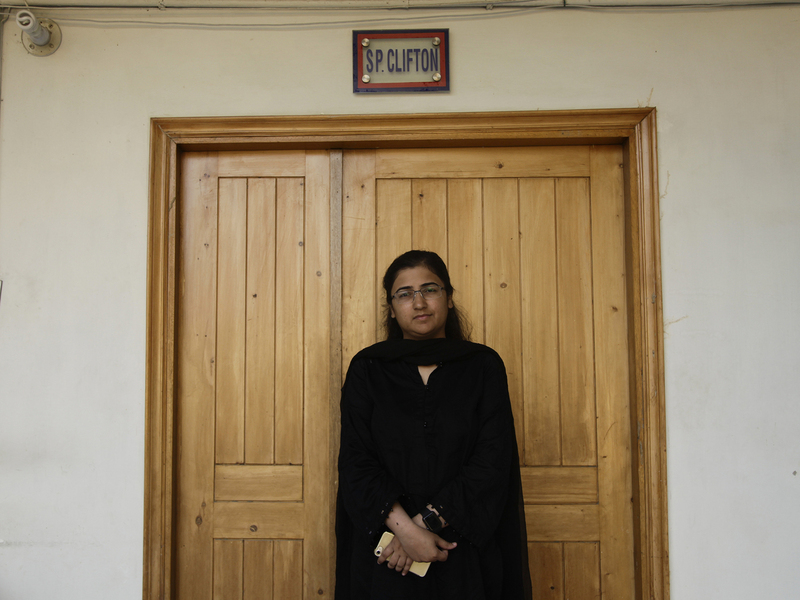 Suhai Aziz Talpur, seen in her office in Karachi's Clifton police station, has emerged as a hero in Pakistan after she led a mission to take down militants who stormed the Chinese consulate in November. When Suhai Aziz Talpur was training to be a police officer, she was ordered to jump off a cliff during an endurance test. She recalls staring seven feet down to the ground. "I said no, I won't jump and break my leg." So her supervisor pushed her. Talpur landed unscathed. Later, her supervisor told her, "The fear is here." Talpur taps her head. "So fight it from here." Talpur, 30, has fought ever since. Now a senior police officer, she has overcome obstacles facing women in conservative Pakistani society and upturned its traditions. She has become a rare Pakistani woman who, if not celebrated exactly for her defiance, is celebrated for what it led to: something that is widely seen as an act of heroism. 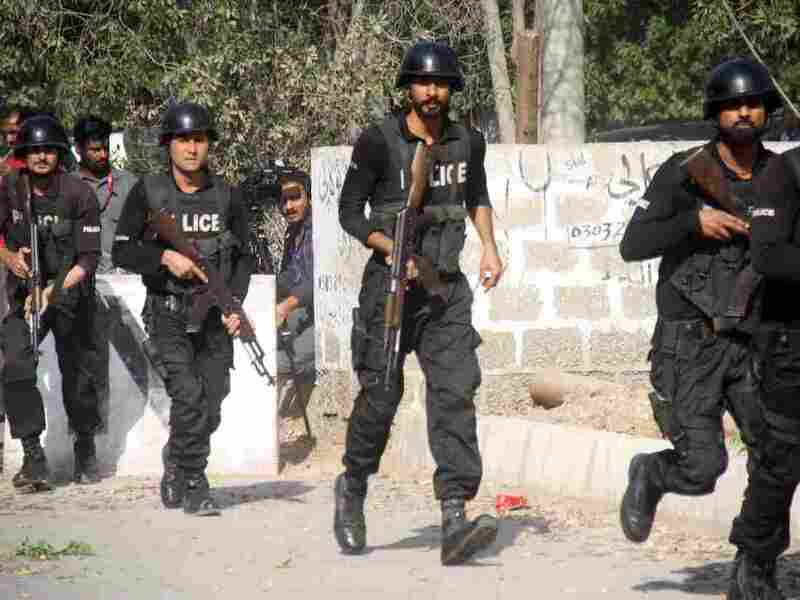 On Nov. 23, Talpur led a police mission to take down militants who stormed the Chinese consulate compound in Karachi. She is believed to be the first woman to lead such an operation. Amid the flurry of attacks engulfing Pakistan in recent years, the attack stood out because it occurred under the gaze of social media, and because it targeted an installation of Pakistan's closest ally. She has since been nominated for one of Pakistan's highest accolades, the Quaid-e-Azam medal for police. If she is selected, she will become only the second woman to receive the award since it was established 33 years ago. "What's unusual is that she's been given a leadership role, and that she is being given prominence, and being given due appreciation," said Bina Shah, a Pakistani writer. "Not for having participated in the operation — but actually having led it." Talpur hails from a town in the Pakistani province of Sindh, where "daughters are educated to grade five," Talpur said. "Then she gets married off, and has five or six kids." Pakistani police respond outside the Chinese consulate after an armed attack on Nov. 23. Her father, Aziz Talpur, a doctor and poet, wanted more for his daughter. So he moved the family to the nearby city of Hyderabad and enrolled his daughter in high school. She recalled her relatives protesting: "You are going to leave the town because of the quality of education – for the girl?" In Sindh, that pressure "has a lot of influence," said Shah, who is also from Sindh. Even when fathers want to support their daughters, "uncles, elder brothers, grandfathers, if they express disapproval, that can hold them back," she explained. "You'll face societal repercussions. Maybe nobody will want to marry your daughter." Talpur's relatives severed ties, but her father persisted, and she ultimately passed a competitive exam to enter the Pakistani civil service. In 2013, she joined the Sindh police force. She said it suited her temperament — initially she'd begun a career as a chartered accountant but found it dull. She was only the fourth woman in her province of 50 million people to join at a senior rank, and newspapers wrote about her. Today, women form less than 2 percent of the 88,536-member Sindh police force, according to the province's Office of Inspector of Police. She heeded her superior's lesson of fighting her fears to muster courage for her next challenge: to tell her father she wanted to marry the man she loved, a man she'd met while studying for her civil service exams. She said Talpur women were always married off to Talpur men — she'd be the first to buck tradition. "I didn't want to make him angry because he did so much for me," she said. Talpur called her father and asked for his blessings. He said no. Talpur recalls biting her tongue. Her father's life was a mashup of tradition and modernity: he has four wives — all of them, except Talpur's mother, were career women. Talpur said she and her six siblings never welcomed his multiple marriages, but they didn't oppose them. Now, she wished he'd do the same. "I should have said this," she said. "But I didn't." Finally, Talpur used a key daughter weapon: she cried until her father relented. "I knew one thing that my father can't [bear to] see is tears in my eyes," she said, laughing. She married and was assigned to work in a border force in northwestern Pakistan. She became pregnant, and worked until the day her doctor reminded her that she'd scheduled a cesarean section. Her son is now a toddler. Police superintendent Suhai Talpur discusses work with a colleague in her office at the Clifton police station in Karachi. Talpur rose through police ranks, working as an investigator, overseeing security in a university town and in a women's protection cell. In October, she was assigned to oversee six police stations in Clifton, an upscale area of Karachi, Pakistan's largest city. The area houses many of the city's consulates, foreigners and elite schools. Weeks later, she received a call from a senior officer that the Chinese consulate was under attack. She rushed to the scene, where her officers were exchanging fire with militants from a separatist ethnic group. There was pluming smoke and grenade attacks, "one after the other." An ambulance screeched to a halt beside her. Inside, "I saw one of my policemen. He was dead." Talpur locked the area down. She sent in the bomb squad to check if more explosives were planted through the area. Her officers searched for more gunmen. "The worst part," she said, "the consulate has around 11 schools in its vicinity," and she feared children were targets. Two hours later, it was over. Two policemen were killed, along with two civilians and all three militants. "We entered the consulate. I saw a Chinese lady, she hugged me, and I told her: You are safe now," she said. "It was a very proud moment for me." A widely shared image from that day shows Talpur leading bulky men with assault rifles. In another, she stands alert, holding her pistol. People are sheltering and blood pools on the ground. But a caricature of Talpur was widely shared, too. It shows her grinning before a microphone. She wears a medal – and stands on the bloodied corpses of her two slain colleagues. One Twitter user shared the image because the sacrifices of the two slain policemen were forgotten "while Pakistani liberals and feminists were busy in building the image" of Talpur, he tweeted. He also tweeted that Talpur "deserves censure if not sacking" for not preventing the attack. Talpur won't comment on the backlash, and says she mourns her slain colleagues. Mostly, she has been praised. Since the attack, her phone rings and beeps constantly as women ask her how to join the police. "I think that just looking at an officer, a female officer, wearing a uniform, commanding men and leading some operation, in itself is quite inspiring," Talpur says. "I am, with the grace of almighty Allah, a successful role model for women."